The Castle School of English | Learning English reading skills: Common mistakes. This is why English language schools in the UK will help and support you. They will give you advice and even recommend books for you to read. Reading is an important part of any English exam you might need to pass to get a qualification in English language. 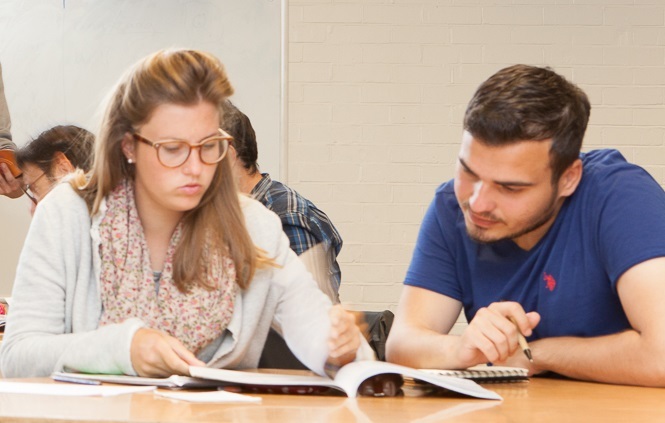 English language Exams for international learners include Cambridge examinations such as IELTS, First Certificat FCE or Cambridge Advanced CAE. There are two common reading mistakes people make when they are learning English. They think that if they choose a very difficult book, they will become a brilliant reader faster. They think that they must use a dictionary to look up every word they see that they don’t know. They think that otherwise they will not understand the book, and will not learn how to read properly. They might even think they are cheating if they don’t know all the words! We have an English expression to describe what is happening in number 1, we say "You are learning to run before you can walk." Learning to read is the same as learning the other areas of English. It is a developmental process. You should always learn the skill at the appropriate level for you. If you try to read a book that is too difficult for you, you will probably get demotivated, frustrated, and bored. Also, and perhaps more importantly, you probably won’t improve your reading much. Struggling to understand a sentence with an unfamiliar structure, which contains vocabulary that you don’t know, is not really reading – it is solving a puzzle. Ideally, you need to know what your level is and then read books that are specially designed for people of your level of English. Language schools in the UK, for example Castle School of English, often call these books "graded readers." They are not children’s books. They are often examples of classic or modern literature with interesting stories for adults. They have been rewritten using easier English for people who want to learn the English language. Most good bookshops in Brighton sell these books, and they are also available in the Brighton Library. The coursebooks you use in English lessons also focus on reading skills, with short reading exercises which are designed for your level. Try to understand the general meaning from context. This is how languages are natually learned. In number 2, I want you to think about how you read in your own language. Do you ever read something and there is a word you don’t know? Do you immediately reach for a dictionary? Or, do you read the rest of the sentence and paragraph, and guess what the word means from the context it has been used in? This is how most people read. You really don’t need to know every word. As a matter of fact, this is how we learn the meanings of words when we are small children and throughout our lives. We hear (or see) the word used in a context and guess what it means. Every time we hear the word in a different context, our brain gets a more accurate idea of its meaning. This is the most natural way to learn any language! To conclude, you will learn to read English faster if you choose reading materials that are appropriate for your level, and if you try really hard NOT to use a dictionary. This is actually good news for you, because it is also the most enjoyable way to practise reading.